Being able to sync your Google Contacts with your OSX Contacts is possible – it just takes a bit of digging. As a long-time iPhone 4 user, I was recently introduced to the wonderful OSX Messages app, which lets me read/send iMessages from my Mac, as if I had sent a text from my phone. Such an amazing thing (even if it does only work with other iPhone users). However, it only used phone numbers to identify contacts; less than ideal since I seldom reference my friends and family by their cell numbers. I use Gmail for all my email purposes; and after loosing my completely contacts list TWICE from the failures of Windows Mobile 6, I am also a huge advocate for Google Contacts – awesome synergy between my phone list and email contacts. and while I’ve been very happy Syncing my email/calendar/contacts between Google and my iPhone; my Mac just didn’t want to come to the party and I refused to retype my contacts manually. At first I tried syncing the contacts over Google’s Microsoft Exchange Protocol (which is actually the best way of syncing Gmail/contacts/etc onto the iPhone), however you cannot get the necessary SSL to connect to Google on Mountain Lion. Next I tried backing up my iPhone contacts into iCloud, which also failed. I was about to give up until I discovered that the preferences for the Contacts app has an option that I didn’t know about. 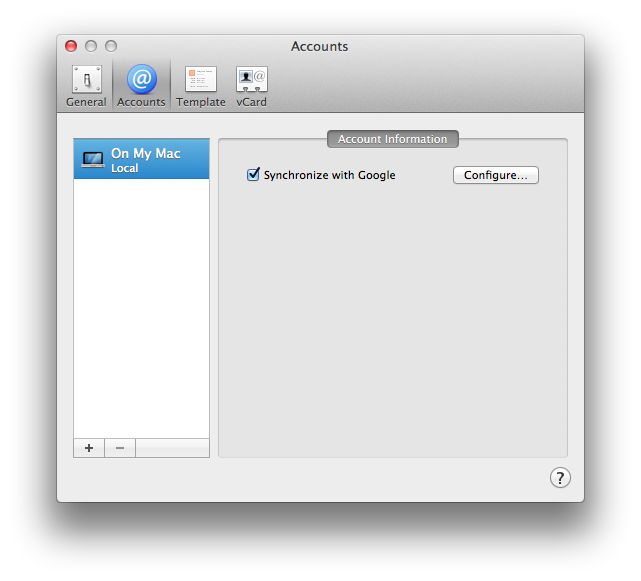 Carefully disguised under the “On My Mac” account, you will find the option to sync with Google.